Yonked :: Diary of a New Home: In which the glass finally arrives... and is not quite full. Excitement abounds... oh but the smell! The blue tape is dead, long live the blue tape. In which the glass finally arrives... and is not quite full. We've been waiting for our new shower door for a long time. 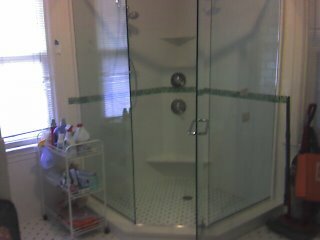 First we had to figure out if we wanted the frameless glass doors (well, we knew we wanted them, but could we afford it?) We had talked about glass block, about all other kinds of stuff. We finally decided that we did want it. Then we got the tile in to the bathroom, which turned into a bit of a debacle as the tile installer took ten extra days to do stuff, and then installed some of it poorly, and didn't order enough corner tiles. We then found the shower door company, and brought them out to look and measure. Then we started saving our pennies, and shifting money around to make sure we could afford the insanely expensive glass. We order the glass, and then we have to wait for it to be made. Then they call us to say, "How about tomorrow?" And we're like "Yeah, great!" and that morning they are supposed to come it turns out they cut the glass wrong and they can't come, but don't worry, we'll have it in 5 days! One month later, I give them a call to say "Hey, what's going on?" And they say, "Oh yeah, we apologize we delayed your project a month. How about Thursday?" And I say fine. Anyway, it turns out that they miscut the glass AGAIN! (because one of the walls is not quite square-- they apparently cut the glass backwards!) So they will arrive at some point in the future to replace that panel that is cut incorrectly. At least, that's what they say! But the glass is in (mostly!) and 24 hours or so from now, I might even open the door! Now if we can fix the light in the bathroom, we might even get to take a shower in there! Comments on "In which the glass finally arrives... and is not quite full." We didn't take a shower in there yet, but we took a "Dry run" where we got in the shower to see how it would work out-- it turns out y ou can see EVERYTHING from inside the shower-- the washing machine and dryer, the toilet, the sink-- everything! I'm not sure, I guess perhaps in my mind I've always thought of the shower as a private sanctuary space-- I didn't get how in this shower, that won't be possible. I sure hope I can get used to it!